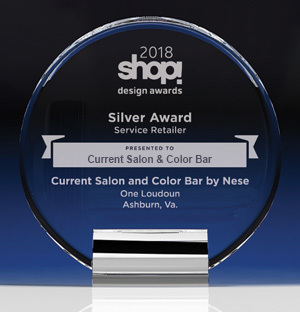 Current Salon & Color Bar was recently named a Silver Design Award winner in the “2018 Shop!” Awards Competition, which recognizes the best new designs in retail environments and experiences. The “2018 Shop!” Awards are considered by many to be the “Academy Awards” of the retail design and brand marketing industries. We had a lot of fun designing our new salon space and are thrilled to be recognized for the effort! We put a lot of time into designing the stylist stations in such a way that clients have their individual space while also feeling part of the overall energy of the salon. In contrast to most salons, which do not have open floor plans, our 14’9” ceilings and suspended styling mirrors create an open, energetic space that allows our stylists to work collectively as a team with their clients. One of the focal points in the salon is our Color Bar. Its’ centralized location keeps our clients in the center of the action while they relax with their coffee or work from their phone or computer. Our wash area, by contrast, is private and peaceful, with reclining wash bowls for comfort.